Rotorua reminds me of Hermione Granger’s beaded handbag: small from the outside, it was bottomless inside, so she could pack all the supplies she might need one day in it (those included Perkins’ tent, that easily accommodated seven Weasleys and Harry Potter – not sure I really need this detail here, but it’s Harry Potter, you know). Anyway, the population of Rotorua is only 71,700 people. Might look like a sleepy little place. But the truth can’t lie any further from that. You can never have enough time to explore all the activities and entertainments Rotorua has to offer! And I know what I’m talking about – we live in Tauranga. 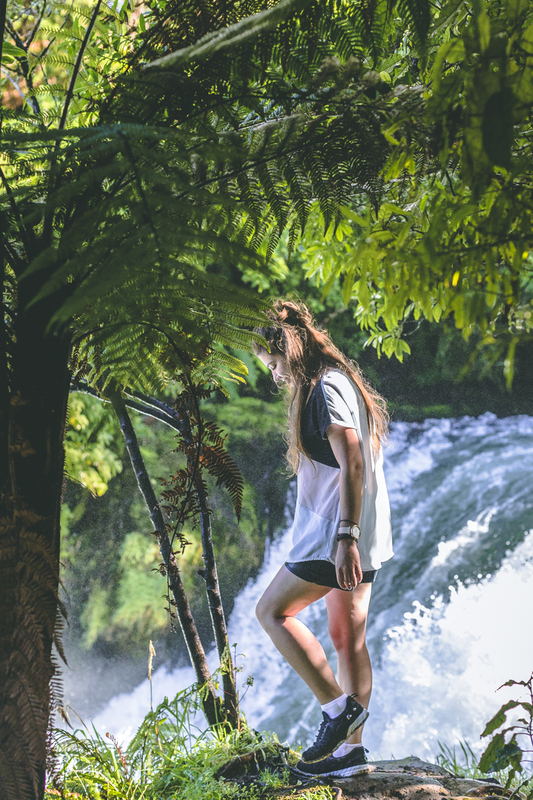 With Rotorua being located only an hour away, it has been our go-to choice for a cool weekend getaway for the last two years. 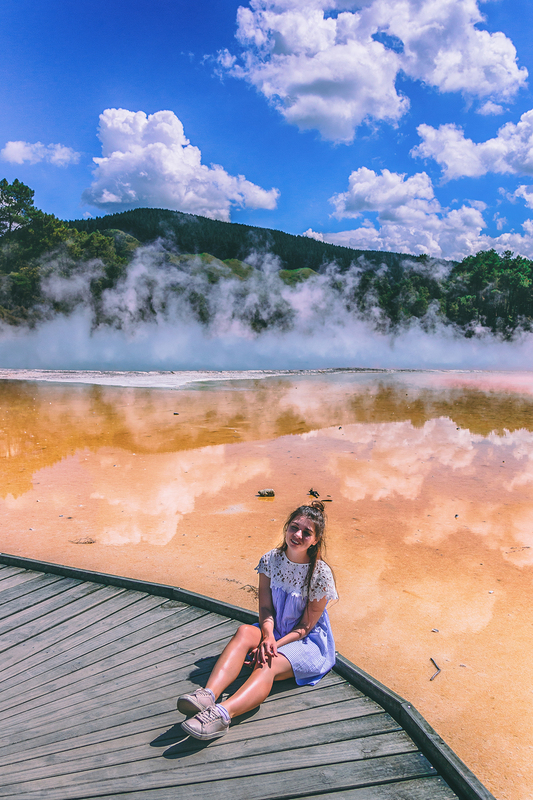 I admit it’s impossible to collect all the Rotorua must-see’s and must-do’s in one article, but here are at least MOST OF the places that you’ll never regret discovering. Skyline Rotorua. They call it ‘attraction #1’ for reason. Our own version of the well-known Skyline in Queenstown lifts you all the way up to spectacular views and fun luges in a beautiful eight-seater gondola. Always loved these things, remind me of mountains and snowboarding! Gondola-only ticket is $31 with extra $14 for a single luge ride (you can book up to 7 rides for $65). Geothermal parks. No doubts, what Rotorua is famous for! Steaming, bubbling and awe-inspiring valleys are all around the town. The question is – which one will you choose? We have visited Te Puia, Waimangu Volcanic Valley and Wai-O-Tapu Thermal Wonderland. Compare all three and pick your fav! Government gardens. Looking for a postcard-view place? It’s here! Rotorua museum, housed in the old Bath House building, is currently closed for earthquake strengthening, but many people never even go further admiring its remarkable facade. 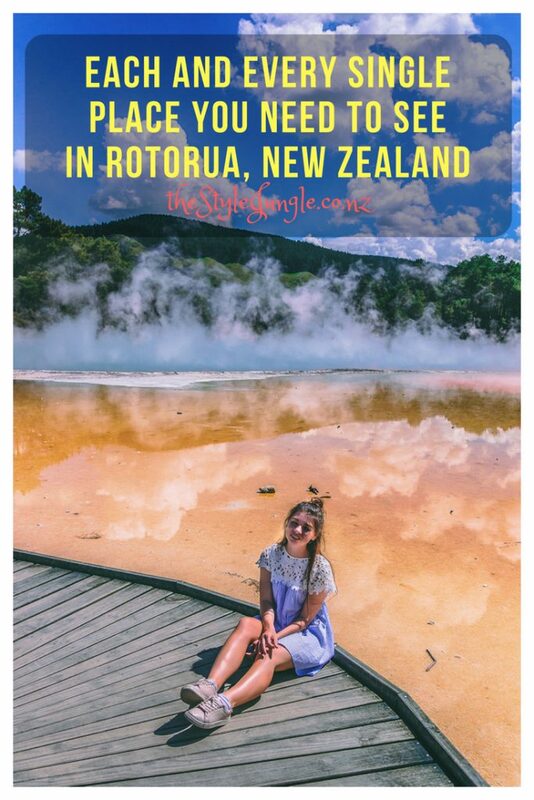 If you were ever browsing for Rotorua travel tips, you must have seen it! The public park itself is all blooming and colourful in summer and hosts several more historical sites. Māori village. You won’t find a better place to learn more about the culture and history of Māori. 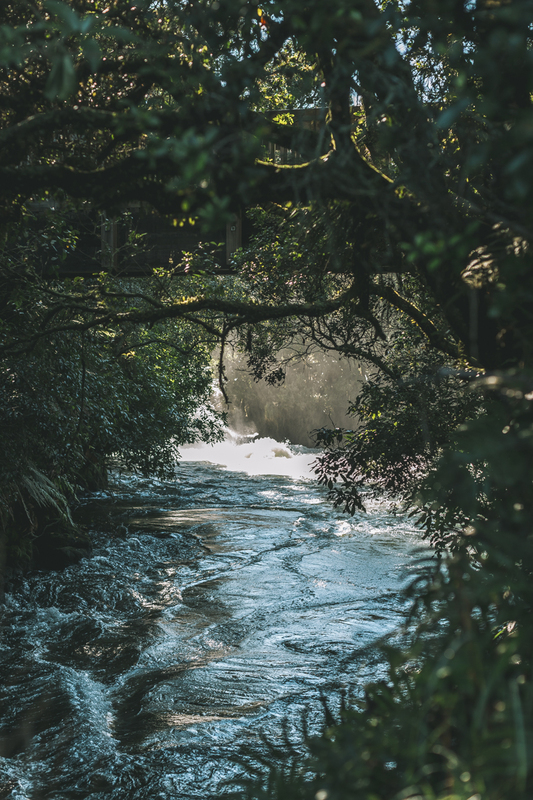 Will it be a beautiful concert in Te Puia or one of the authentic Māori villages – it’s entirely up to you, but you definitely can’t skip this part when visiting Rotorua. Combine a concert, hāngi (traditional food) and glowworm bush walk in an ultimate evening experience available at Mitai Māori Village or visit Ohinemutu – a lakeside village that is home to around 260 people. Hot pools. If there is still some volcanic activity going on under the surface (and you can totally smell it when entering the town), there certainly should be places, where the heated and enriched with minerals and microelements water erupts, forming epic pools, right? Polynesian Spa is the most popular among them. Perfect location right by the picturesque Lake Rotorua and the fact that it was voted a World Top Ten Spa for many years attracts thousands of tourists. 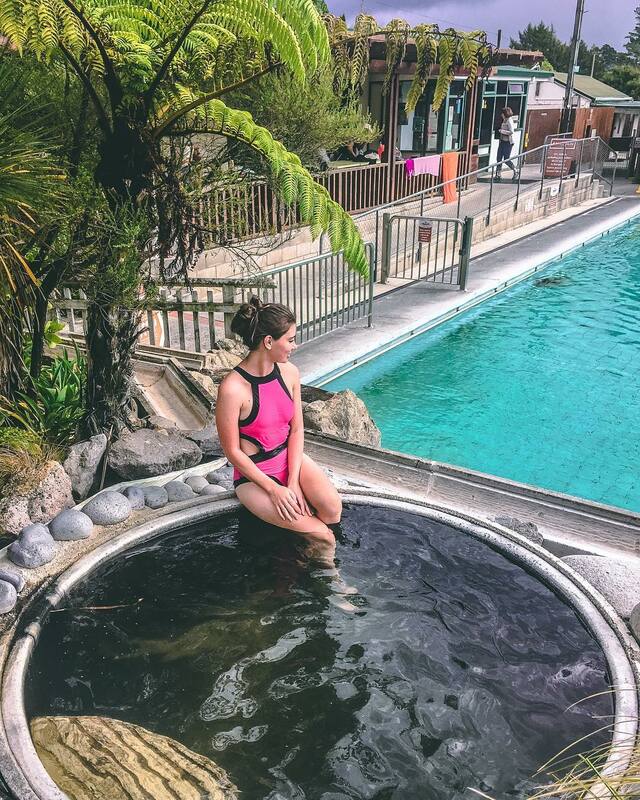 For a more tranquil experience go to Waikite Valley – 10 beautiful thermal pools with different temperatures and even a short track to the place where the New Zealand’s largest pure boiling spring comes from. It’s also way cheaper, with prices starting from just $17. Redwoods Treewalk. Unique attraction and an absolute must do! We have been there several times and you can never get used to seeing the giant trees (some of them are over 100 years old!) from the bird’s eye perspective. 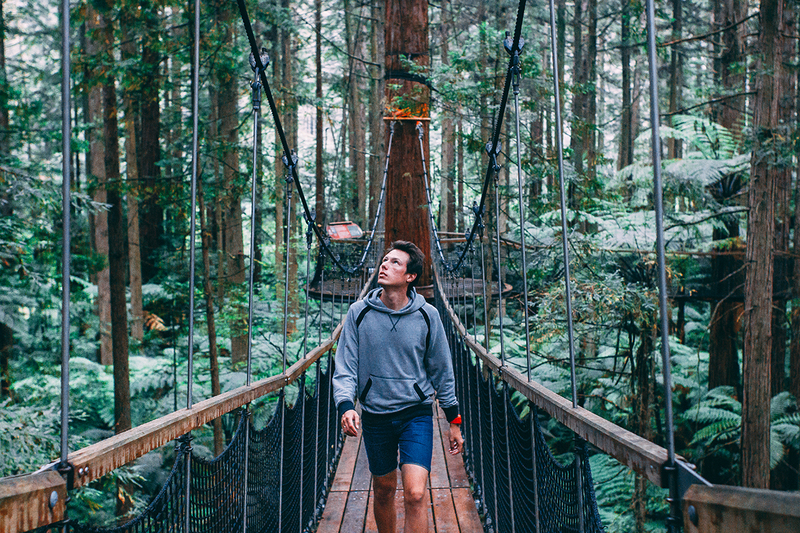 The walkway of suspension bridges is 553 metres long and is worth seeing both during the day and at night – they turn on magical colourful lightning in the evenings. One entry is $25, ticket for both day and night sessions is $35. Make sure to spend some time walking at the bottom of the Whakarewarewa forest trees afterwards as well, the most scenic place ever! Eat streat. While many cities have their own ‘food streets’, Rotorua’s one is definitely the coolest! Not only does it have roof to protect you from the rain, but also a thermally heated footpath! Which makes it a perfect all-seasons al fresco dining area. Can’t recommend Mediterranean food from Café Ephesus and a Wild Rice Thai Cuisine enough. Paradise Valley Springs Wildlife Park. The place I want to return to again and again! Lovely wallabies, friendly deers, funny goats live in a peaceful native bush. Lions are stealing the show every day at 2.30 pm. But I was more impressed with kea feeding. This smart birds are hilarious and so funny to watch! Entry is $27 and make sure to buy some special animal food, you’ll regret not being able to feed these cuties (I had to make several runs back to the entry to buy some more). Volcanic Hills Winery. Award-winning winery, making different red wines from grapes collected all over the country. Thing Marlborough, Central Otago and Hawke’s Bay. Though you won’t be able to walk among the rows and rows of grapes here, wine testing alone is still a very special way to spend the evening. Okere falls. Our unexpected summer discovery – a chain of small waterfalls surrounded by the beautiful native bush. Such a nice sunrise walk for those traveling on a budget or a thrilling rafting adventure for those ready to invest in some special memories. Make sure you’ll stay and watch brave rafters going down the stream anyway – so much fun! Zorb. Rotorua is known as ‘the extreme capital’ of the North Island, so if luge doesn’t sound extreme enough, go for zorb! Rolling down the hill in a giant transparent ball – how does that sound for an adventure? And did you know, that not only was these crazy activity invented in New Zealand, but exactly Rotorua is the place of the very first zorb-operating company in the world? Choose from five tracks and go beyond excited in a ‘wet zorb’. Rides start from $45. River jet. Yet another extreme activity to challenge your nerves. There are several companies offering speed rides. Kaituna River Jet will take you 25 km down the river, Kawarau Jet operates on Lake Rotorua, but the best one is ‘The Squezze’ – two hour adventure in Tutukau Gorge, that starts from a jet boat ride until you reach the narrow crevasses with a knee-high warm water, that you’ll have to, you got it, squeeeeeeeze into. A naturally heated pool brings a well-deserved break after all the adventures. $89-$179 for a day like that is not a big price, trust me! Hamurana Spring. Looking for the clearest water you have seen? Make sure to visit this place! 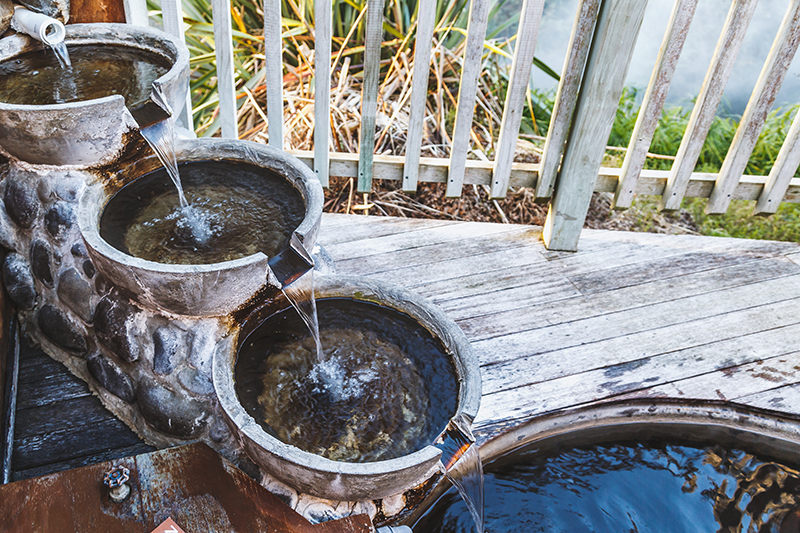 Just a 15-minutes drive from Rotorua and you’re in an idyllic location with crystal clear springs, coloured with shades of turquoise, jade and emerald. It takes water 70 years to get purified in underground aquifers and appear outside in full glory. Isn’t it amazing? Canopy Tours. 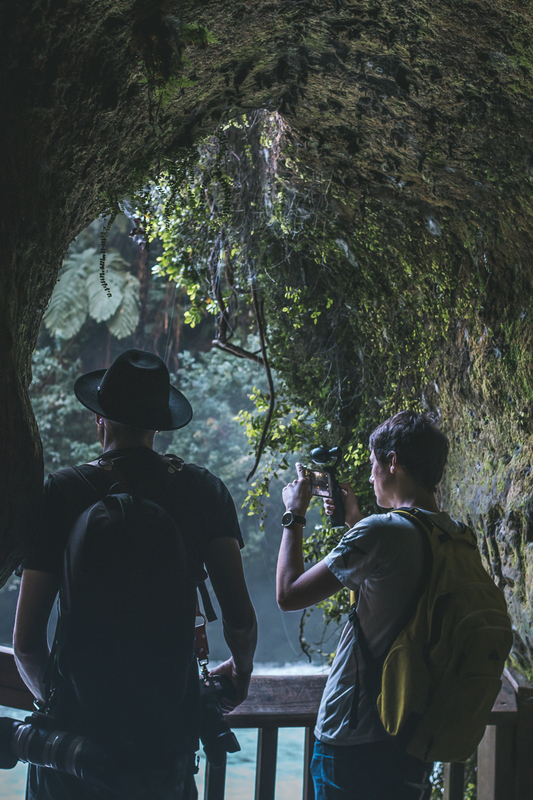 Swing through the native forest with this TripAdvisor #1 activity. Canopy tours are organised for small groups (if your group is too small, it will be combined with some other people) and guided by experienced people. Get ready to scream! Zip lines are not always the fastest, but flying through the bush is still a pretty adrenaline experience. Mixed route of zip lines, bridges and platforms is slightly more than one kilometre long and takes around 3-4 hours to complete. The Original Tour is $149 and The Ultimate (longer! higher! faster!) is $219. And what are your favourite places in Rotorua? Have something to add to the list? Follow theStyleJungle on Facebook and let us know there!